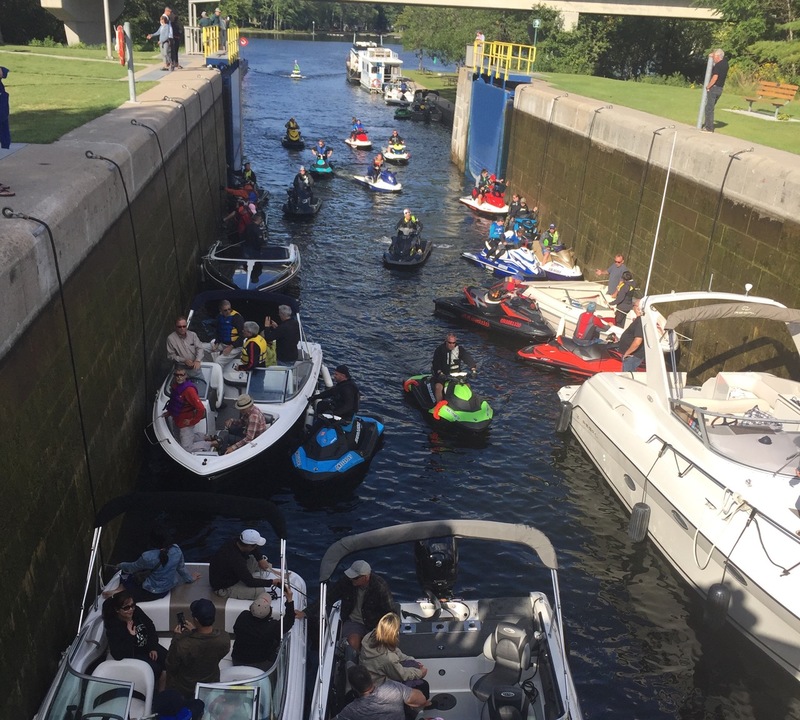 Where are the best Trent Severn Waterway PWC rides? 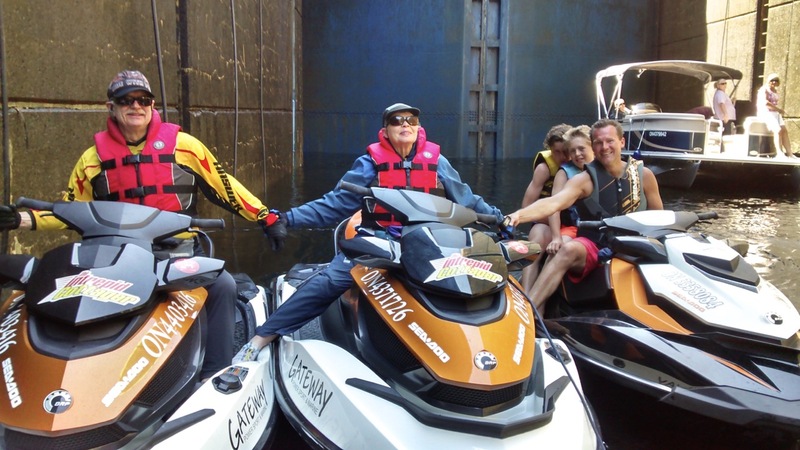 With two free days of lock passage coming up – Sunday June 24 and Sunday, July 1 – personal watercraft riders will want to make the most of their freebie day rides. The Trent Severn Waterway is a 387-kilometre linear watercourse that runs generally east to west. It covers many elevations of land with 45 locks between Lake Ontario and Georgian Bay. Along the way, it also includes some of Ontario’s most popular lakes – Simcoe, Couchiching and many of those in the Kawarthas. Certainly if you have the time, inclination and wherewithal to do overnighters, you can ride the whole Trent Severn. I did this several years ago and it’s a neat experience. However, for day rides on the no-charge lock dates, I recommend choosing one of the sections of the Trent Severn Waterway listed below. To assist your planning, I’ve attached links to my tour articles with services included for each recommendation. Also, check out this waterway map complete with marina and lock locations. It will help you ascertain the sections of the waterway with multiple locks back to back. You can do this ride from either end, depending on which is closer for you. There are good public launches at Trent River (under the south end of the Highway 30 bridge) and besides Roger’s Park on Little Lake, Peterborough. From east to west, you’ll ride the Trent River, Rice Lake and the Otonabee River. This 75-kilometre route (one way) includes two locks at Hastings and Scott’s Mills (Peterborough). You can chop off 24 kilometres total by launching from Hastings Village Marina instead of Trent River. While at Little Lake, I recommend making the time to go through the Ashburnam Lock to ride up and down on the unique Peterborough Lift Lock. Just stay in the lock when it lifts to the top and come back down with it – the round trip is well worth the experience. This is a 65-kilometre ride if you stick to the buoys. It leaves from launches at either Burleigh Falls in the east accessing Lovesick Lake or at Fenelon Falls in the west on to Cameron Lake. It also includes these Kawartha Lakes – Upper & Lower Buckhorn, Pigeon and Sturgeon. You can extend your riding distance by exploring any or all of the various lakes en route. Or add in side trips to Chemong, Little Bald and Big Bald for a longer day. Full ride includes four locks, Lovesick, Buckhorn, Bobcaygeon and Fenelon Falls. If you want to avoid the Fenelon Falls lock, try launching from The Landings Marina & Restaurant on the west shore of Sturgeon Lake. Launching from Lauderdale Point Marina at the south end of Sparrow Lake avoids the long, slow speed zone between lakes Sparrow and Couchiching. From there, it’s a 40-kilometre run up the Severn River to Port Severn, where The Trent Severn Waterway ends. Along the way, Gloucester Pool provides good exploring options. Don’t miss a swim at White’s Falls at its north end. 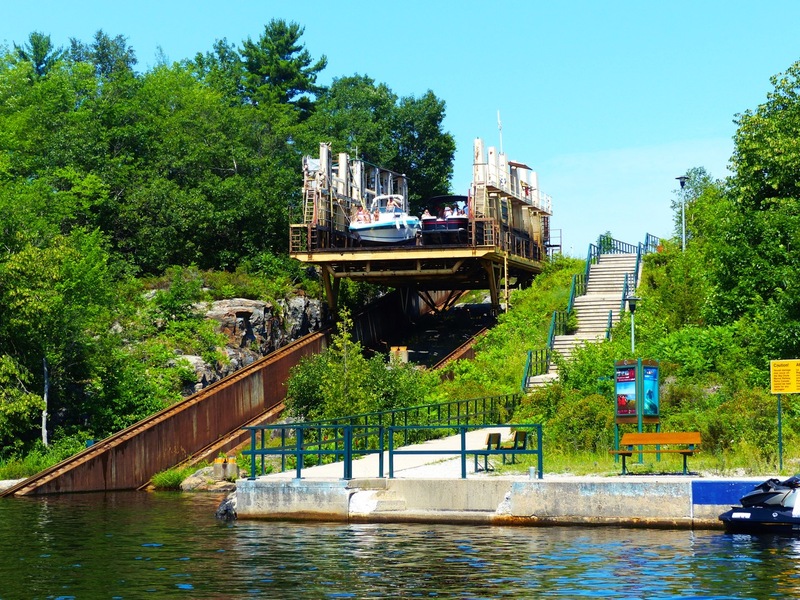 This river ride features one of the system’s largest locks, Swift Rapids, and the engineering marvel known as the Big Chute Marine Railway. If you want to add some distance, lock through at Port Severn and follow the buoys about 10 kilometres to Honey Harbour. But only if the wind isn’t blowing strong to make Georgian Bay rough! The Trent Severn Waterway buoys mark the way for about 45 kilometres through these two larger lakes. On less windy days, they also make for a good PWC ride. But since there are no locks to go through, you can do this ride any time. So why waster a free lockage day? For access, there are good public launches at Barrie (Kempenfelt Bay, Lake Simcoe) and Orillia (Lake Couchiching) that enable you to spend a day exploring these two water bodies. Or try launching from Bradford (marina access south of town on the east side of Highway 11 south side of river). And then ride up the west branch of the Holland River to Cook’s Bay on Lake Simcoe. 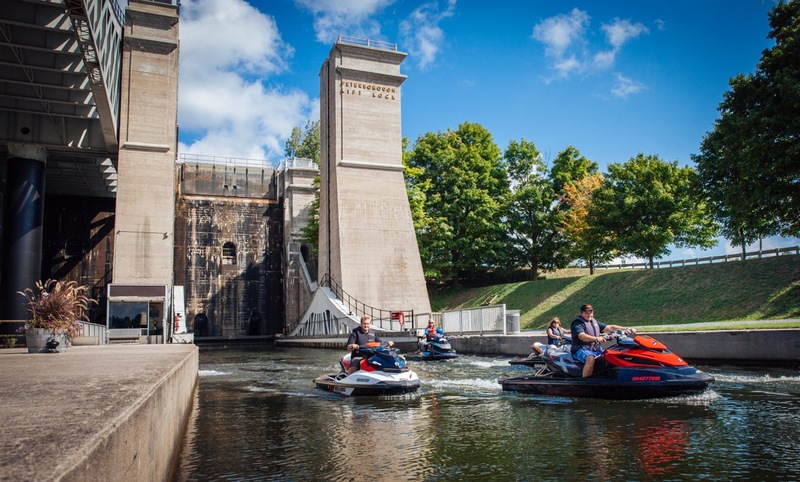 No doubt, the Trent Severn Waterway will provide you with an excellent day of personal watercraft riding. 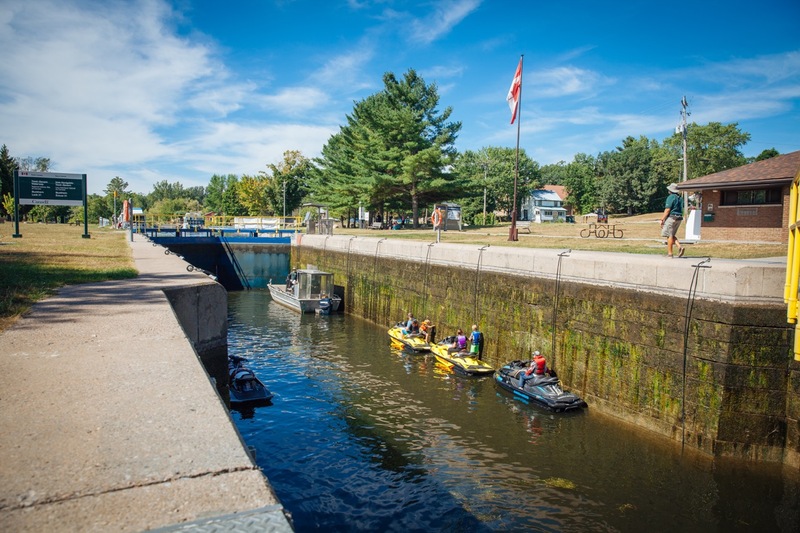 So why not make it even better by planning to go on the June 24 or July 1 free lockage days?